JOINT BASE LEWIS-MCCHORD, Wash. – The low hum of voices and rustle of paper rise and fall with the waves of Cadets filing in for medical processing. Nurses give directions to new arrivals while a doctor looks over a Cadet who may be allergic to bees. A Cadet avoids looking at the needle as a nurse fills the syringe with blood. At the back of the building, several staff members organize more than 7,000 records of Cadets who will participate in the Leader Development and Assessment Course (LDAC). Each month, the medical staff processes more than 3,000 Cadets at LDAC. 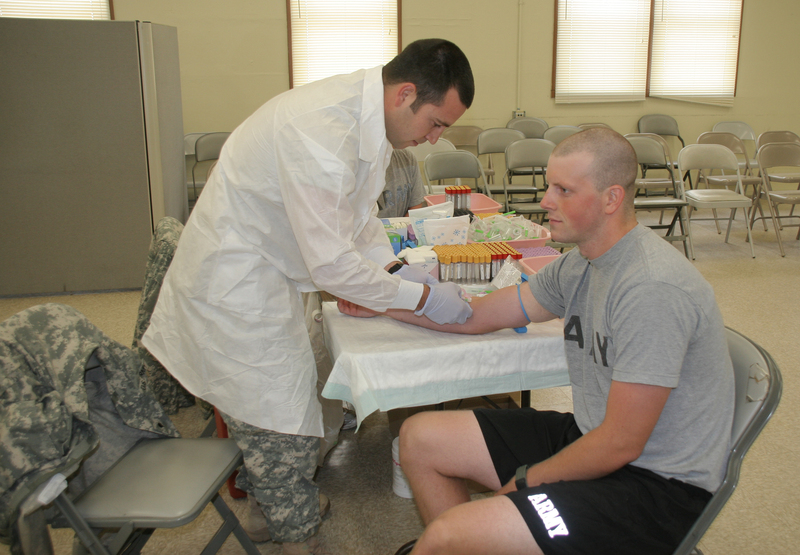 The initial medical examination marks the beginning of a process involving a team of doctors, nurses and medics in charge of keeping Cadets healthy at LDAC. Cadets are processed through the medical facilities on their second day at LDAC. A large tent near the medical facilities is the starting point where Cadets fill out informational cards, which provide information on the DNA of the Cadet. Blood is drawn and added to their card before going to a facility for their permanent records. These cards follow the Cadet throughout their military career with their entire medical history. The medical staff also focuses on giving Cadets the tools to prevent injuries or ailments as soon as they arrive. In teams of around 50 Cadets, the troops are given a preliminary presentation on health issues. This includes how to take care of their feet, avoid insects and maintain proper hygiene in the field. The ears of these Cadets are checked and measured for custom ear plugs to protect their hearing during weapon familiarization exercises. After this presentation and initial check, Cadets file into the medical processing area. Those who have medical problems, such as a recent surgery, new medication or severe allergies, see an on-site doctor. “We have direct connections to Madigan Army Medical Center, which can provide Cadets with specialists if they need to see an orthopedist or allergist, for example,” Linda Brown, Warrior Forge surgeon said. Those who do not need to see a doctor get their blood drawn. The blood is separated for a HIV test, a check on their immunizations records and for their DNA card. 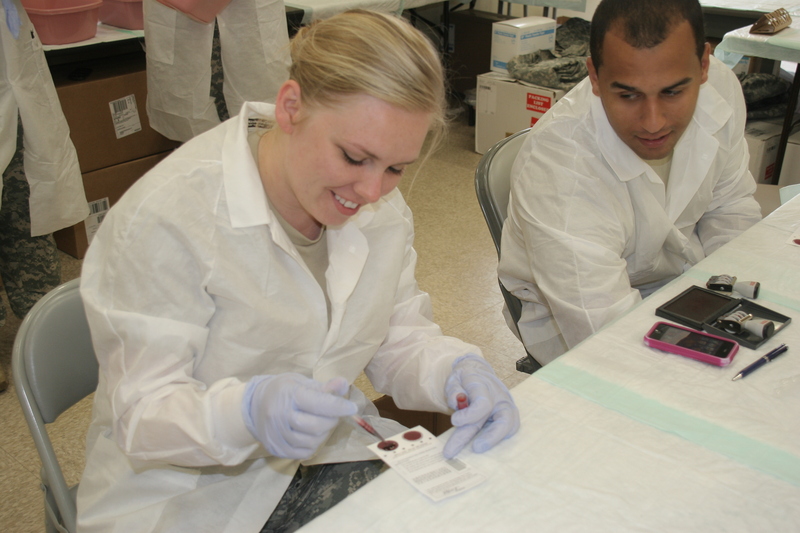 These tests validate Cadets’ vaccination records by ensuring they are immune to diseases such as chicken pox and mumps. Those interested in competing for flight school are sent to a more hands-on physical, said Lt. Col. David Cassella, deputy chief nurse. The medical team measures the length of each Cadet’s arms as well as their standing and sitting heights to ensure they will have the right amount of reach for cockpit controls. An EKG test ensures those who want to be pilots have a healthy heart. The blood pressure and pulse of Cadets must fall into a perfect range in order to pass the stringent standards for this course. “A lot of Cadets who don’t meet the medical requirements for the flight school are still in perfect shape to continue on within the Army,” Cassella said. Medical staff are near the regiments’ barracks and in the field, well-supplied and ready to assist. The Warrior Forge Medical Clinic provides in-garrison service 24 hours a day, seven days a week to over 6,500 Cadets and 3,000 cadre who attend LDAC. Cadets spend over two-thirds of their time at LDAC in the field and this central clinic only receives those injured or ill in-garrison. In January, the medical staff begins planning for the three months it will be open for LDAC. Each testing course has two medics, on-call doctors and an ambulance driver to provide on-site medical support. Maj. Wayne Hersha, a rotating physician for Tactical Training Base (TTB) West, provides support for the medics following Cadets during their Tactical Training. If the medics cannot adequately treat a patient, the Cadet is brought back to the base to be looked over by a physician. A Cadet may then be transported to Madigan Army Medical Center if the case is deemed severe enough. These medically-trained officials must be prepared for everything from a small scratch to a broken limb. Every night, physicians host sick call. During this time, Cadets see a doctor who checks their ailments and diagnoses illnesses. The most common reasons a physician sees a Cadet are sprained ankles and colds, Hersha said. Preventing problems before they begin is also important in the field. Medical staff show Cadets how to maintain proper hygiene, such as changing their socks daily while staying in the base, Hersha said. Every 48-hours, commonly used supplies – such as bandages and aspirin – are delivered to the medical tents. Any special supply requests are met by ambulance drivers who work shorter shifts and can deliver small shipments from the main medical clinic. Acting as a far-reaching component of LDAC, the medical staff keeps Cadets going – from the moment they set foot at camp, to their bus-ride toward the next step in their Army career. From the barracks to the middle of the Land Navigation Course, medical personnel are ready to get Cadets back on their feet to finish LDAC.